Hello everyone... Helen is here. I hope you all are getting ready for New Year now! Isn't that crazy? We are at the end of the 2018!!! But the end is the new beginning. So... today I have an encouraging card to share with you all. It is an easy and quick card you can make and send to others, too. I started with creating the background using the Doodle Flower Background Clear Stamp. I stamped it using the regular MISTI on a light pink cardstock using the VersaFine Clair Charming Pink Ink Pad. After that, I cut the background panel and the background mat using Fancy Frame Dies. I added both of them on the white card with permanent adhesive glue. Next, I stamped the frame from the Light Bulb Moment using Mini MISTI with the VersaFine Clair Charming Pink Ink Pad and then I stamped the sentiment from the New Year New Me stamp set inside the frame using the VersaFine Clair Nocturne Ink Pad. After that, I fussy cut the frame with micro-tip scissors. For the tag, I added some pink watercolor pain on a watercolor paper using smooshing technique and then I dried it with craft heater. After that I cut it with one of the Stitched Tags Nesting Dies. I added the tag on the card with permanent adhesive glue, and then I added the twine bow on it. I then added the sentiment label on the card with 3D foam tape for the dimension. I embellished the card with some white pearl gems. That's my card today and I hope you all enjoy this card today. Thanks for joining me on the Joy Clair Blog today as I work through one of my latest Bible Journaling pages using the Dwelling Place Stamp Set. This set is just perfect for illustrating your Bible! Such cute images and great truth! One of my passions is to share Bible Journaling with others and I lead workshops in my local area. 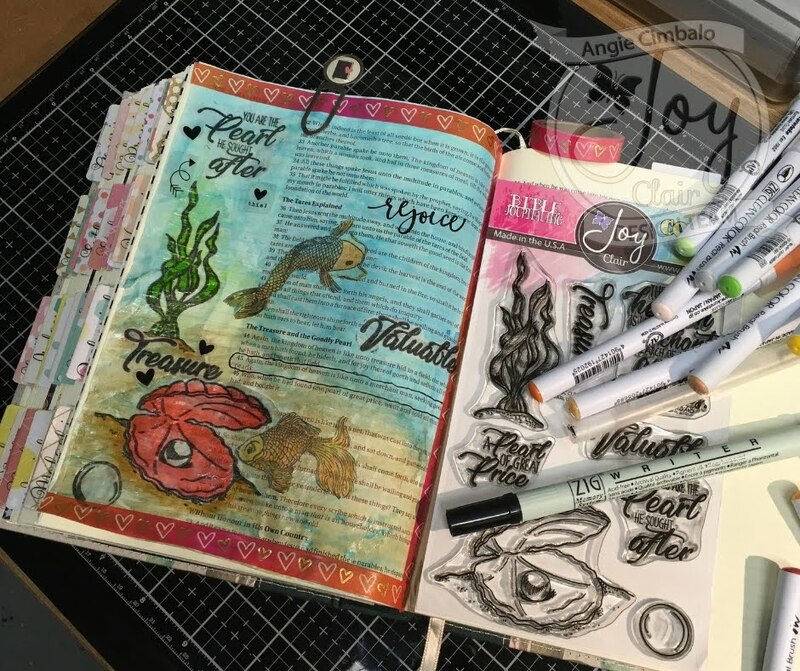 So many are just unsure of where to start and can get discouraged by the beautiful artwork they may see others do in Journaling Bibles. My encouragement to you today is that it does not matter what the page looks like! Complicated or simple, text or artwork, crayons or watercolors – it is about worshiping the Lord. It is easy to let supplies and comparison distract our hearts from what truly matters – your time spent with the Lord. This page is an example of how to use Joy Clair stamps on a fairly simple page to illustrate the Scripture simply and clearly. Not all pages have to be complicated and with these adorable stamps – Joy Clair takes the hard work out of it so you can spend more time in the Word. I started by selecting the verse and what stamps I wanted to use. I choose the popular verse from Joshua – “As for my and my house, we will serve the Lord.” This is a favorite verse of mine, but also is a text stamp in this set! I used the verse and house stamp on the bottom of the page near the verse using an acrylic block and a VersaFine black ink pad. I also underlined the verse using a Sharpie Non Bleed through pen. I used watercolors to color in the cute house! I also made sure to date stamp my page for future reference as I do all of my pages. I decided I wanted to use the cute Window stamp as a border on top of the page. I also used a flowered cardstock flag to make a tab for the page and stamped the word Home on it from the stamp set. Under the tab I stamped the Gather Together stamp. I wrote out a prayer in the margins and used an enamel heart to finish off the page. Thank you for joining me today on the blog and I can't wait to see how you all use this cute stamp set! Hello everyone.. Helen is here today. I have a Bible journaling page to share with you... Today, I am reading from the Gospel of John 17. It is prayer of Jesus before His last day on earth. So many promises we can get from this chapter. One of them is from John 17:12 that Jesus is our protector, no one can compare to Him! This journaling page is actually a vellum insert page.I trimmed the 8.5" x 11" vellum paper into 7.25" x 6.25" that fits inside the ESV Journaling Bible. I stamped the images from the Dwelling Place Stamp Set (house), Fly With Me Stamp Set (clouds and birds), and Let's Celebrate Stamp set (strings to make the hill) using Memento Tuxedo Black Ink Pad. And while the inks still wet, I sprinkled some of the clear embossing powder on the images and then heat set it with craft heater. I stamped the sentiment from the Dwelling Place Stamp Set in the middle of the house with VersaFine Clair Purple Delight Ink Pad. While the inks still wet, I sprinkled some of the clear embossing powder on the images and then heat set it with craft heater. After all the stamping and embossing, I colored the images with ShinHan Touch Twin Alcohol Markers. Alcohol markers work well on the vellum but need to make sure the ink dry well before you touch it, which it dries pretty quickly. The next step is to add the vellum insert page on the Bible. I used the thin double sided tape (ScroTape). Add the tape on the back side of the page. Adding the page is need to be very careful since it is double-sided tape and permanent. Super sticky! It is better to lay the Bible flat, line up the vellum on the page, and then close the Bible to make sure it adhere well. After I added the page, then I realized that I forgot to color the roof and the chimney. So I grabbed the alcohol markers again and colored them right on the Bible. My journaling insert page is done. I love how it turned out and I do hope you like it, too. Angie here today with a Bible Jounal page using the brand new Joy Clair Color By Faith stamp set called "Pearl of Great Price". "Again, the kingdom of heaven is like a merchant looking for fine pearls. Who, when he had found one pearl of great price, went and sold all that he had, and bought it." This parable helps us recognize that the Kingdom of heaven (the Kingdom of God) is far greater than anything. It IS our treasure, far more valuable than earthly treasures, and nothing compares to a loving relationship with our Creator. After discovering that we can enter God's Kingdom, we have the option to go back to our old ways of life or we can seek love, forgiveness and joy in God's kingdom. Powerful words to help you keep your life focused on Christ. I started by stamping the stamps from the set on some tracing paper and then cut them out. I hope you enjoyed my Bible journaling page - be sure to check out all the Color By Faith stamps from Joy Clair - they make journaling in your Bible very easy! It's Donna here, I pray that everyone is having a wonderful day celebrating the season with family and friends! I could not resist using this cute stamp set by Joy Clair called Christmas Penguins! It is such a cute set (I know I think I say this about all of Joy Clair sets). This set has a penguin and you can stamp different outfits on the it. Hello Friends! Merry Christmas! Thanks for joining me on the Joy Clair blog today as I share journaling in the book of Psalms with The Reason Stamp set. This set includes angels, a manger scene and many words of the season! This would be perfect for Christmas cards or even tags on Christmas gifts. One of my favorite things about this set is the beautiful font! I love journaling in all sorts of different medias and this time I found myself in a small book of ESV Psalms by Crossway books. I chose Psalm 96 to journal in - Let the heavens rejoice and the earth be glad! What greater celebration can we have than Jesus coming to the earth to save us from our sins! I used the Mary, Joseph and Jesus stamp for the bottom right hand page along with 'The King is born' stamp and also highlighted the Scripture using watercolors. For stamping I used Versafine Clair black ink and a thin acrylic block. (I have used many clear stamps and am always impressed by the quality of Joy Clair! I know you will be too!) I also put a row of red and green washi tape on the bottom of the page for decoration. On the other page I used the angel stamps to frame the Psalm title with their trumpets. I applied some gold glitter watercolor onto the page near the trumpets to look like confetti! I applied the stamps, Joy, Rejoice and Peace to the bottom of the page. With the washi tape, watercolors and stamps used this is a simple and fun page to praise the Lord with! I look forward to seeing your Christmas creations with this stamp set and may you and yours have a very Merry Christmas! It's Ceal, here to share some crafty time with you today. Can you believe that it is December and 2018 is almost gone?! where has time gone? Every year it seems like the time between Thanksgiving and Christmas gets shorter and shorter as does the year. Do you make New Years resolutions? I used to make them and tied my best to keep them, now I really don't make them anymore and if I do it's kind of a humor thing like my card in which you are probably thinking I don't see the card as being humorous but you wills when I explain below. I used the set New Year New Me, I love the sentiments in this set. To Create this card, I started with a white top folding card base, a green pane cut to A2 size as a nat and a white panel cut down with a stitched die. I stamped the largest poinsettia from the 3D Christmas Poinsettia set in the corer and then stamped the other three on a scrap piece of cardstock colored them using Comic markers in R24 and R46 and then fussy cut them out. I colored the poinsettia that I had stamped in the corner with the same colors of Copic markers and stacked the ones I had cut out on top using glue dots, this gives it the 3D effect. For the border along the side and bottom of the card, I used the pine branch also from the 3D Poinsettia set. I stamped it in green and then added some Nuvo crystal drops in red berry over the stamped ones because it was all green. To finish the card I added the Happy New Year greeting and adhered the panel to the green panel and adhered that to the card base. Now remember I said my card had humor? well it does, on the inside I stamped the sentiment "Resolutions are for people who aren't already awesome" and I am going to send it to my teenage friend that I used to make resolutions with every year. Hello everyone! Today I'm sharing a card I made with the Joy Clair Snowy Greetings set. I adore the all the snowmen and snowflakes in this set! I started by using the background building stamp from Snowy Greetings to stamp an area on both the top and bottom of the card front ( using a light gray ink), so that it would peek out from underneath the main image panel. I then stamped the panel with the image of the three snowmen standing together in black. For a little added interest on the background I used the larger snow flake images from Snowy Greetings and stamped them randomly in a light blue ink. Using Distress markers and an old Wink of Stella brush pen (filled with water), I lightly colored the snowmen bodies with a light blue and added a little shadow to the ground below. Don't you just love the shimmer if adds, reminds me of shimmer of real snow on a sunny day! I then took a pink Distress marked and used it to color in the hats and scarves. I used a water brush with regular water for them as I didn't want them to sparkle too. To finish the card I used a blue washi tape to create a border above and below where my panel would be, as well as add a die cut snowflake. Before I adhered the panel I stamped the sentiment and then popped it on with some foam tape. Hello and welcome! It's Angie here today with some holiday projects that are really fun! Isn't it really an awesome set? I love all the numbers because you can use them for so many things and the sentiments are great and there is a LOT of them in this one set! I started by stamping the number for all the years, with the check box and check mark with Versafine Clair Nocturne ink. Next I used a Tim Holtz "Rays" stencil with yellow ink, then cut the cardstock down to fit the wine tag. I used the MFT wine tag die but if you don't have it, you could cut a rectangle and use a circle die or circle punch to cut the hole for the top of the wine bottle. And here's a picture of the tags on the wine bottle. This will be a perfect holiday gift for a friend!!! Nuvo silver glitter drops, snowflake sequins, plaid paper and a hexagon shaped die from my stash. I love it when you can make two cards at once by using the pieces from one on the other! And I hope you enjoyed my holiday projects! I hope you are having a great December so far! Don't forget to check out all the stamps at the Joy Clair store! Hello Joy Clair friends. It's Kerry here and I 'm back with another fun card. I created this card using the new Light Bulb Moment stamp set as well as the New Year, New Me stamp set. To create this card, I stamped the Resolutions sentiment using Lady Bug Memento Ink and then stamped the sentiment and the check box using Memento Tuxedo Black ink. It's quite helpful to use a stamp positioner (I used a Misti) to place the images in the perfect locations. After that, I moved on to stamping the small stars and the dots. I love how these little images help finish a card off! I grabbed a yellow Copic marker and colored the stars to finish off the stamped panel. To complete the card, I mounted the stamped panel onto gray cardstock then onto a white card base. Pretty CAS, no ribbon and ready to pop in the mail! WOO HOO!